Today I’ve had the enormous honour and pleasure to present during the OpenSouthCode conference, held in Malaga, my own city, where I’ve been so fortunate to live and work since 1999. I’ve been speaking about something I’m very proud to be a small part of: the Accenture DevOps Platform. An open source, continuous delivery platform with many unique aspects like fast stand up, easy maintenance, extensibility and resilience. Did I already mention it is open source? As it is incredibly brilliant! I’d like to publicly thanks, once again, to the organisation for giving to me this unique opportunity of divulge about this piece of technology in my own city, and to the participants for their questions during and after the session. 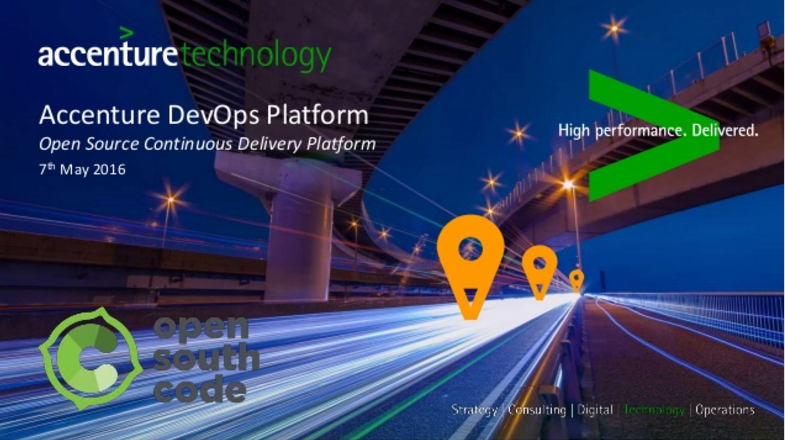 For those that could not attend, or are just curious about what the Accenture DevOps Platform is, I’ve uploaded the slides to Slideshare here. They are written in English. Links on Slide 15 seem to have been lost, can you post them somewhere? Fixed, thanks for letting me now!